Combine all ingredients except the chicken on a medium sized non-reactive bowl. Whisk until well mixed. Add chicken to a gallon sized zip top bag. Pour the marinade on top and seal the bag. Let chill in the refrigerator for at least 20 minutes. Preheat the grill to medium-high heat. Grill until cooked through, about 5-7 minutes per side, basting periodically. Chicken will be done when juices run clear. The whole process seems faster and cleaner. Anyone with small children knows that the hours from 4:00 pm until bedtime can be pretty crazy. As much as I love to cook dinner, my kids don't always love the fact that I'm cooking dinner. Grilling is kind of a compromise because we're all outside. For some reason, me standing at the grill vs. me standing at the stove feels so different to them. There are no little people hanging on my leg as I try to flip chicken or burgers. There is no cranky mommy telling anyone to stop being so loud because we're outside. And I can give them a few pushes on the swing before I need to attend to something on the grill. I also really enjoy the lack of mess associated with cooking outdoors. There aren't tons of pots and pans to wash or splatters on the stove to wipe up. I like to marinate my meats in zip-top bags so I can toss it when it's done instead of worrying about cleaning up raw meat juices. 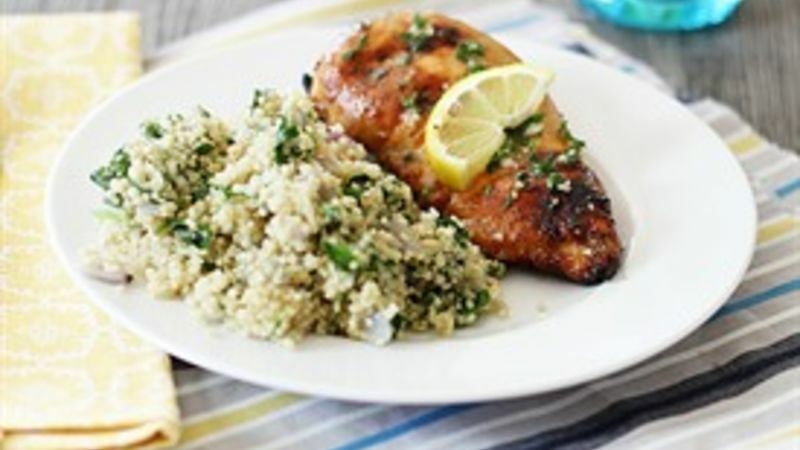 Lemon chicken is a popular choice for grilled chicken. This version has some additional flavor from honey, garlic, and parsley.